Lars Bergström was educated at Stockholm University, where he received his Ph. D, in 1966. He has been Professor of Practical Philosophy at the University of Uppsala from 1974 to 1987, and at Stockholm University from 1987 to 2001. He is a member of Academiæ Regiæ Scientiarum Upsaliensis, and of Societatis Litterarum Humaniorum Regiæ Upsaliensis, The Norwegian Academy of Science and Letters, and The Royal Swedish Academy of Sciences. For many years he has also been one of the directors of the annual Philosophy of Science Conference at the Inter-University Center in Dubrovnik, Croatia. 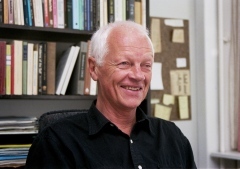 He is also the editor, since 1980, of the Swedish philosophical journal Filosofisk tidskrift. His main fields of interest are moral philosophy, value theory, the philosophy of science, and the philosophy of W.V. Quine. He has also done work in political philosophy, the philosophy of language, and the philosophy of religion. Imperatives and Ethics, Stockholm University, 1962. The Alternatives and Consequences of Actions, Almqvist & Wiksell, 1966. Frågor om livets mening (Questions about the Meaning of Life), edition, Prisma, 1979. Grundbok i värdeteori (Foundations of Value Theory), Thales, 1990. Ubåtsfrågan: en kritisk granskning av den svenska nutidshistoriens viktigaste säkerhetspolitisk dilemma (The Question of Submarines: a critical investigation of the main foreign policy dilemma in contemporary Sweden), edited together with Klas Åmark, 1999. Filosofin genom tiderna: Efter 1950, 2:a upplagan. (Edition of philosophical texts. After 1950.) Texter i urval av Konrad Marc-Wogau, Lars Bergström och Staffan Carlshamre, Thales, 2000. Döden, livet och verkligheten. (Death, Life, and Reality.) Essäer. Thales, 2004. Tankegångar. Sexton kapitel om kunskap, moral och metafysik. (Reasonings. Sixteen chapters on knowledge, morals, and metaphysics.) Thales, 2011. 'Notes on the Value of Science', in Logic, Methodology and the Philosophy of Science (utg. D. Prawitz, B. Skyrms and D. Westerståhl), North-Holland, 1994. 'Reflections on Consequentialism', Theoria, vol. 62, 1996. 'Scientific Value', in International Studies in the Philosophy of Science, vol 10, 1996. 'The concept of ownership', in Who Owns Our Genes?, Nord 2000:11, Nordic Council of Ministers, Copenhagen 2000. 'Davidson's Objections to Quine's Empiricism', in P. Kotatko, P. Pagin, G. Segal (utg.) Interpreting Davidson, CSLI Publications, Stanford, 2001. 'Putnam on the Fact-Value Dichotomy', Croatian Journal of Philosophy, vol. 2, no. 5, 2002. 'Underdetermination and Physical Theory', i R. Gibson (utg.) The Cambridge Companion to Quine, Cambridge University Press, 2004. 'Quine's relativism', Theoria, vol. 72, 2006. 'A defense of Quinean naturalism', i C. B. Wrenn (utg.) Naturalism, Reference, and Ontology. Essays in honor of Roger F. Gibson, Peter Lang, New York, 2008. 'Principles of voting power', manuscript, 2009. 'Death and eternal recurrence', in The Oxford Handbook of Philosophy of Death, ed. Ben Bradley, Fred Feldman and Jens Johansson, Oxford University Press, 2013. ’Quine and the a priori’, in A Companion to W.V.O. Quine, edited by Gilbert Harman and Ernie Lepore, John Wiley & Sons, 2014. ‘Comments on Castañeda’s semantics of prescriptive discourse’, Theoria, 1962. ‘Alternatives and utilitarianism’, Theoria, 1968. ‘Utilitarianism and deontic logic’, Analysis, 1968. ‘Imperatives and contradiction’, Mind, 1970. ‘What is a conflict of interest?’, Journal of Peace Research, 1970. ‘Utilitarianism and alternative actions’, Nous, 1971. ‘On the coherence of act-utilitarianism’, Analysis, 1973. ‘Hintikka on prima facie obligations’, Theoria, 1974. ‘On the formulation and application of utilitarianism’, Nous, 1976. ‘Reasons in ethics’, in Contemporary Aspects of Philosophy (ed. G. Ryle), Stocksfield, Oriel Press 1976. ‘Utilitarianism and future mistakes’, Theoria, 1977. ‘Intersubjectivity in social science’, in Danish Yearbook of Philosophy, 1977. ‘Some remarks concerning rationality in science’, in Rationality in Science (ed. R. Hilpinen), 1980. ‘Føllesdal and Davidson on reasons and causes’, in Tankar och tankefel (ed. W. Rabinowicz), Uppsala, 1981. ‘Outline of an argument for moral realism’, Grazer Philosophische Studien, 1981. ‘Interpersonal Utility Comparisons’, Grazer Philosophische Studien, 1982. ‘Underdetermination and realism’, Erkenntnis, 1984. ‘O vrijednosti znanstvene spoznaje’, Filozofska istrazivanja, God. 6, Sv. 4, 1986. ‘Quine on underdetermination’, in Perspectives on Quine (ed. R. Bartlett and R. Gibson), Blackwell, 1990. ‘Explanation and Interpretation of Action’, International Studies in the Philosophy of Science, vol 4, 1990. ‘Quine, Underdetermination, and Skepticism’, Journal of Philosophy, vol. 90, 1993. 'Interview with Willard Van Orman Quine in November 1993' (with Dagfinn Føllesdal), Theoria, vol. 60, 1994. 'Interview with Donald Davidson in November 1993' (with Dagfinn Føllesdal), Theoria, vol. 60, 1994. ‘Quine's Truth’, Inquiry, vol 37, 1994. ‘Prawitz’s version of verificationism’, Theoria, vol. 64, 1998. ‘Quine, Empricism, and Truth’, in P. Kotatko & A. Orenstein (eds. ), Knowledge, Language and Logic: Questions for Quine, Boston Studies in the Philosophy of Science, Kluwer, 2000. ‘Quine’, in Companion to the Philosophy of Science (ed. W.H. Newton-Smith), Blackwell, 2000. 'Democracy and future generations', in F. Tersman (ed.) Democracy Unbound / Basic Explorations, Stockholm 2005. 'Democracy and political boundaries', in F. Tersman (ed.) The Viability and Desirability of Global Democracy, Stockholm 2007. 'Degrees of democraticity', manuscript, 2007.